Jen and I both seem to have reached an important decision. We both came to the decision at the exact same moment. It happened about halfway through our salad last night. The decision was this: we now hate salad. As the healthy tone of January fades into our memories the immense amount of salad consumed doesn't. Instead it sits there in our frontal lobes like a compost heap in the mid-July sun. Even if we could allow ourselves to forget it by closing our eyes, the dizzying aromas will not allow us to. 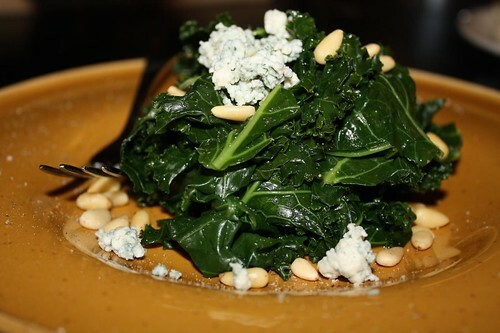 Since the healthy people of the world believe that leafy greens are the best thing that anyone can consume I made this "salad" of steamed kale, lemon, pine nuts, and blue cheese for Jen. I did no make one for myself. Jen ate half. I'll take that as a major triumph after the dread I feel just looking at this picture. It's like looking at a picture of your saddest childhood memory. The main course was another great round of cleaning out the fridge. 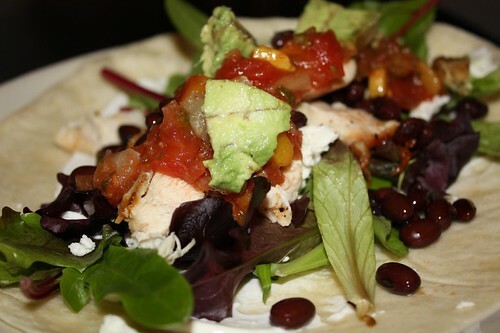 I made some tacos out of the remaining salad greens (by cleverly not making them into salad), the remaining mango salsa from the Superbowl, black beans, remaining avocado, some chicken breast, and some sour cream. They were pretty tasty for something that required no real planning or preparation. The tastiest part of it all: emptying portions of the fridge to make way for a new crop of vegetables to come into the world and serve their time before one day getting a chance to see "Avatar" for $7.50. Oh the vegetables of today. They don't know how good they have it.